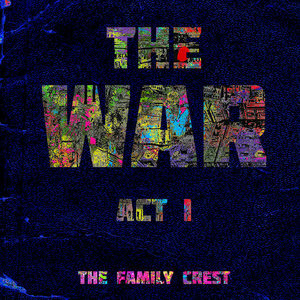 The War: Act I is another triumph for the Family Crest, showcasing once again why they equal—if not outdo—just about every one of their stylistic peers. Formed roughly ten years ago, orchestral rock/pop outfit the Family Crest has always delighted listeners with their hodgepodge of gorgeously dense arrangements and invigorating songwriting (rivaling standout contemporaries like Emanuel and the Fear, Dirt Poor Robins, Fleet Foxes, Grizzly Bear, Bent Knee, and the Dear Hunter in the process). In particular, last year's Prelude to War EP was an intensely varied, catchy, and heartfelt appetizer that built immense anticipation for its full-length continuation. Fortunately, those expectations have been met—if not surpassed—with The War: Act I, a stunning sequence that delivers on everything fans could've hoped for. According to founder/frontman Liam McCormick, the LP marks "the first act of a greater, multi-tiered project, a kind of serial concept album with a pronounced thematic arc that weaves ideas of pride and memory, dissonance and divergence". Specifically, he says that it's about internal conflicts regarding how "we're all equally capable of doing wonderful things and terrible things". Also, he's been writing it more or less since the start of the group, so he finds it fitting and ironic to release it now, at a time when there's so much "civil discord" in the country. That social awareness, coupled with McCormick's own "experiences as a half-Irish, half-Chinese American growing up in a largely white community", helped fuel the fires that burn within The War: Act I. Despite the explicit story of the work, though, he ultimately wants listeners to bring their own interpretations to it. While past releases saw the core septet joined by outside players—an "extended family", as McCormick call them—The War: Act I ups the ante by featuring approx. 150 musicians "of all different skill levels". For the band, this serves not only as a means to yield the best record possible but also as "a way of meeting these wonderful people and giving them an opportunity... to make music". It's no surprise, then, that The War: Act I features some of the most multilayered and dynamic arrangements the Family Crest has ever written. Of those trademark bombastic treats, opener "To Love You" serves as one of the full-length's best. An initial array of foreboding yet victorious orchestration soon gives way to a softer melding of piano chords and McCormick's elegant croons. It doesn't take long, however, for the two to unify into a robust and alluring collage of symphonic vibrancy (including chaotic percussion, strings, and horns) and emotional decrees. It's an impeccable start that sets the stage well for subsequent classical explosions, be they the more romantic and urgent "It Keeps Us Dancing" and "The Mighty Echo" (arguably the strongest track of them all), or the more jovial and hypnotic "Take Tonight", "Waiting Still", and "Never Gonna Stop". Without a doubt, the Family Crest packs each track with plenty of baroque majesty. That's not to say that there aren't gentler and more diverse selections, of course. For instance, "Rest" scales back the intensity (well, until the end) to showcase bittersweet harmonies and subtle flute flourishes. Later, "I Was Born" acts as an exquisitely theatrical ballad, "Like a Light" oozes folksy somberness (which evokes the Great Depression, oddly enough), "The Years" bursts with the kind of flamboyant passion you'd find at a jazz piano bar, and closer "The Rock's Resting on Your Back" fuses '60s pop instrumentation with the kind of Old West flair so commonly attached to Quentin Tarantino films. It's as boisterous, sophisticated, and fetching as anything else they've done, making it a magnificent finale. The War: Act I is another triumph for the Family Crest, showcasing once again why they equal—if not outdo—just about every one of their stylistic peers. Of course, McCormick's timbre and melodies continue to be among the most distinctive aspects of their sound, but that's not to discount the importance and impact of the remaining musicians, all of whom excel at their instrument(s) and coalesce to craft some truly enchanting and resourceful opuses. It is a benchmark release for them, and it makes the wait for Act II quite difficult indeed.